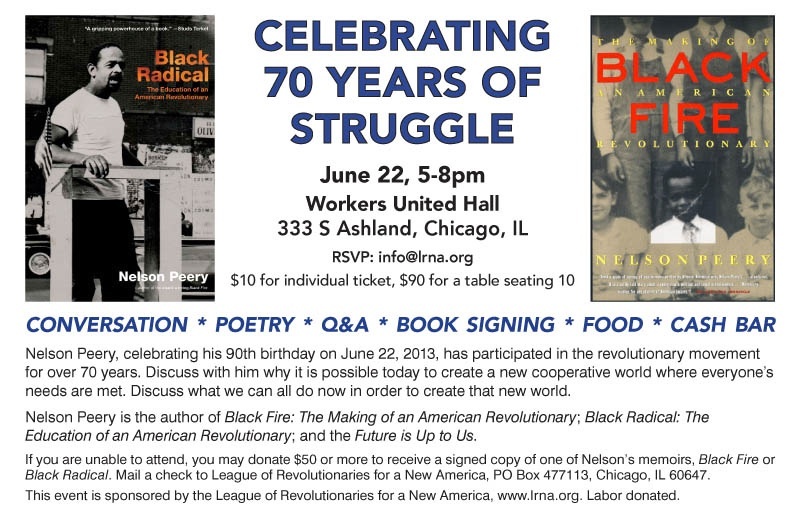 Nelson Peery, author of Black Radical, Black Fire and The Future is Up To Us, turns ninety this month. Nelson is one of my mentors, a person who I first met some 43 years ago in East Los Angeles. He had come to bring greetings from the workers of Watts, California to the workers in East Los Angeles, besieged by the police while protesting the Vietnam War. His message of class unity across the class divide, and in particular the message of the strategic unity of Chicano and African-American workers, struck home even at that time in my unsophisticated mind. In the intervening years I’ve had the opportunity to work in various collectives in which Nelson’s insights were crucial, no insight more than the future really is up to us to create, not to wait for some great leader to give us the answers and to follow. This is a time for new ideas that match the new conditions and new times in which we live, and all of us have a part in contributing to it.